It’s been almost a week since I posted about my fifth “thing.” There are several other things in the School Library Journal’s list that I’d still like to try, but for this assignment I only had to do five. I feel that I’m getting closer to actually tweeting instead of just using Twitter to follow bands (“wait, Brand New is playing a handful of shows in PA after Easter, must go!”) and that would not have been possible without the nudges towards Web 2.0 that were part of this project. The thing I found most useful personally was RSS. Having my favorite blogs gathered in one place and waiting for me is ridiculously convenient. I may occasionally need to click on a link to see an embedded video, but it’s one click and, besides, I know it’s something I want to see. The things that I think could be most useful professionally are the ones that lend themselves to promotion: Facebook, YouTube, and even Twitter. I mean that both in terms of self-promotion (job searches, etc.) and promoting your library and its services. Setting up a Facebook page and a Twitter account for your library is an easy way to get the word out about upcoming events, new services, and even changes in operating hours (such as longer summer hours). Additionally, you could film story time or an author event and post a condensed version on YouTube. It’s extremely important that libraries remind the public and the powers that be of all the good they do for their communities. IMG_0547, a photo by kristininprogress on Flickr. 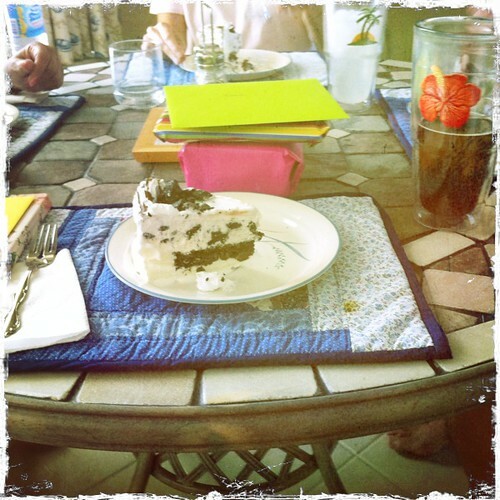 This was the birthday/father’s day cake we had on Sunday. An Oreo Blizzard ice cream cake from Dairy Queen. Awesome. In honor of my birthday I upheld my annual tradition of not working. In recent years that has meant taking a day (or more) of PTO; this year it meant not doing any schoolwork. Unsurprisingly, it also meant staying in bed two hours after my alarm went off (because I hit the snooze button on my iPhone 13 times – yeesh). Even though I didn’t work today, I did accomplish something kinda huge. 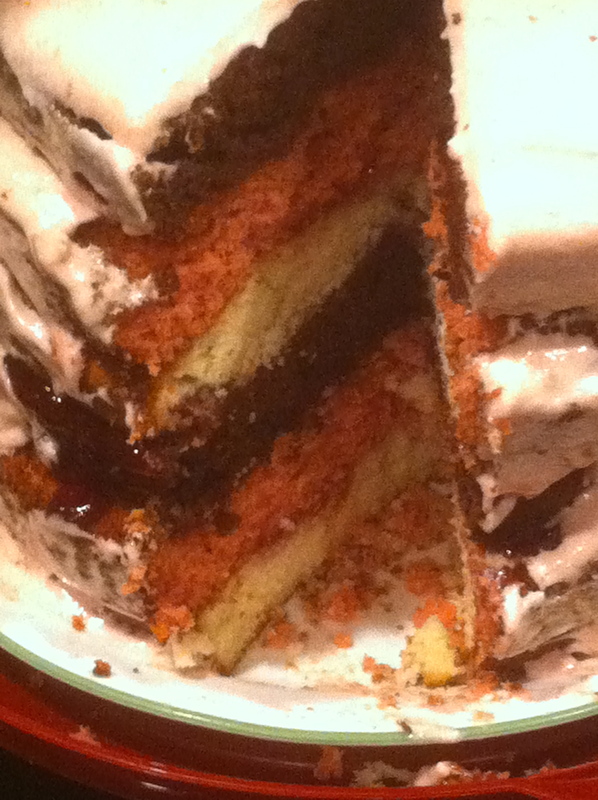 I baked (and constructed) a six-layer Neapolitan cake. It ended up kind of a mess (note to self: six-layer cakes are ridiculous), but it’s delicious. The vanilla and chocolate layers are cake mixes. The strawberry layer and frosting are this recipe from Paula Deen. I put a little strawberry jelly between all the cake layers. Why did I spend hours making this cake? Because I randomly saw a picture of a Neapolitan cake somewhere online and thought it looked like the most delicious thing ever (Neapolitan is one of my favorite ice cream flavors). My cake didn’t turn out nearly as pretty as the one I saw online, but it sure does taste good. My other big accomplishment for the day was watching the Phils game on my HDTV. This doesn’t sound like an accomplishment until you realize that I live in Tampa, where Phillies games are never on TV. A month ago I got myself an MLB.TV subscription as an early birthday present, allowing me to watch games on my computer and iPad. And the Apple TV I received for my birthday allows me to watch games on TV (thanks Mom & Dad!). Oddly, though, I have found that so far I’ve been able to see the games better on my computer and iPad, but that’s because I keep forgetting to get my glasses out of my car. If you’re near-sighted, everything is clearer when it’s two feet (or less) in front of your face. Today’s “thing” is video sites, specifically YouTube, the granddaddy of them all. (Interesting side note: one of the founders of YouTube, Chad Hurley, went to Indiana University of Pennsylvania, my alma mater. Not that I ever met the guy, I just think it’s cool that one of the YouTube guys went to IUP. Sadly this fact is not widely known and has done nothing to erase the confusion most people feel when they first see or hear the name Indiana University of Pennsylvania. It’s a PA state school located in the town of Indiana, PA; it’s really not that complicated. But I digress wildly.) Of all the “things” I’ve covered so far, YouTube is the only one that I embraced immediately upon learning of it. Like most people, I use YouTube almost exclusively for entertainment purposes, but I see it’s potential for libraries, professional organizations, and education. A quick search led me to the YouTube channels for the ALA, the Library of Congress, and the Free Library of Philadelphia (whose most recent posting featured the Phillie Phanatic!). As I’ve said before, blogging is new to me and so is the embedding of media into blogs. Luckily, the process to embed videos in WordPress is pretty simple. I ran into a bit of trouble when I first tried to embed the video because WordPress didn’t accept the shortened URL that YouTube gave me when I hit the Share button, but I got around that by simply copying the actual URL for the page. Everything seems to be working just fine now. I’ve had this Silversun Pickups song in my head off and on for days. Mostly because it’s an awesome song. But also because I’m having my annual birthday/getting older/mortality mini-freakout. Good times. At least it is now officially summer, not that that means anything in Florida, but summer has always been my favorite season. I love this MTV Unplugged performance of “Growing Old Is Getting Old.” In fact, I love SSPU’s entire MTV Unplugged and tend to watch it whenever it’s on Palladia. I never met Ryan Dunn personally, though I did see him out in West Chester once or twice. So explain to me why I got super bummed when I found out he was killed in a car accident this morning. While you’re at it, tell me why I kinda can’t stop thinking about his death. I think the why I can’t stop thinking about his death is easier to suss out. I blame Twitter. Every time I check my Twitter feed, I see tweets about his death. One interesting thing in all of this is seeing who is commenting on his passing. I actually found out he had died through tweets from Philly centric bloggers and news organizations – comments from those people did not surprise me (although the news itself was a total shock). Comments from national magazines based in Cleveland (Alternative Press) and actresses with no Delaware Valley connections that I’m aware of (Alyssa Milano) were surprises. I guess what I’m trying to say is that Twitter is allowing me to see just how big of an impact Dunn made on the national landscape. And it’s kind of impressive, but horrible given the circumstances. The question of why I got super bummed is trickier. Obviously, the news was a complete shock (so much so that when I first saw a RIP Ryan Dunn tweet, I thought it was a joke). But being really bummed out does not automatically follow from being shocked, especially since I didn’t know the guy. There is the whole West Chester connection. For instance, Dunn was apparently at Barnaby’s in West Chester shortly before the accident. Barnaby’s is my favorite bar in West Chester (or at least it was 3 years ago), it’s even where we had my going-away happy hour. (I realize that connection is tenuous at best, but still.) The thing that really stood out to me in the first news report I read was that he had just celebrated his 34th birthday. This was notable to me because a) he wasn’t much older than me and b) my birthday is just around the corner (Wednesday, to be exact). And there it is, I think. Birthdays are a reminder of the passing of time, and tragically early deaths are a reminder of how damn short life is. And I just happen to be in the perfect frame of mind to be really bummed out by this story. Rest in peace, Ryan. You will be missed.